This is not hard to do, and for those with a genuine love for nature, or even just a conscience, it should be second nature. Unfortunately, thanks to the vast numbers of people who now own high-end photography equipment, and are constantly on the look out for excitement – and instant gratification on social media – instances of photographers harming wildlife or habitats in pursuit of the ‘perfect shot’ have become alarmingly common. Some of it is due to a lack of awareness, and some, a result of sheer callousness. Whichever it might be, one thing is certain; if right-minded nature photographers band together, we can stamp out the menace of unethical photography to a large extent. Self-regulation is the best kind of regulation, so let’s kick-start a movement now. One of the most disgraceful chapters in the history of wildlife photography in India is the nest photography craze that spread like wildfire in the early 1990s. In a quest to outdo each other, many photographers practiced a level of insensitivity and brutality that was horrifying. Their modus operandi was quite simple: they would scout around, or offer rewards to villagers, for locating active nests. Once the nest of a desired species was discovered, the photographer would land up and do some ‘gardening’ – a euphemism for removing leaves or twigs to get a clear view of the nest. With the obstructions out of the way, nesting activity would be photographed from all angles, sometimes with multiple flashes positioned around the nest. Once the photographer was satiated with his efforts, he would depart, leaving the exposed nest vulnerable to predators. Some went even further, and destroyed the nest (and eggs or chicks) so that other photographers could not take advantage of their ‘find’. This went on for a few years, until there was severe condemnation from conservationists and photographers with a conscience. The pernicious practice finally died out when nest pictures were banned from competitions. However, even today, thanks to the despicable actions of those uncaring photographers, all nest pictures, including those shot unobtrusively, are viewed with suspicion. Back then there were far fewer nature photographers in India, so any damage caused by a few unethical ones was somewhat limited. Since entry barriers for newcomers were formidable, the annual increase in the number of ‘wildlife photographers’ was incremental. Cameras and lenses were far more expensive due to prohibitive customs duties. It was rare to see someone with a 300mm lens, let alone anything longer! Film and processing were costly too. And not everyone had a car to take off into the countryside on weekends. The kind of money needed to pursue this expensive hobby was largely restricted to an affluent few. But all that changed with economic reforms and the technology boom. Suddenly, youngsters were able to get five-figure salary jobs straight out of college. At the same time, customs duties dropped drastically, camera manufacturers set up dealerships in India, social media took off, and wildlife documentaries on television ignited an enormous thirst for travel and photography. Nature photography as a hobby took off on an exponential curve. While there’s nothing wrong with wanting to enjoy nature and photograph wildlife, how we do it matters. ‘Enjoyment’ must be tempered with responsibility. Unfortunately in India, the two rarely seem to go together. How many times have you sat in a movie hall trying to concentrate on a crucial bit of dialogue, while someone nearby has a loud conversation on their cellphone? It’s more often an ‘educated’ person who’s the culprit rather than some ignorant illiterate. And just as there are millions of ‘educated’ people with fancy cars, but with absolutely no sense of road etiquette, there are thousands of ‘educated’ people with the latest cameras and lenses, but without the least bit of sensitivity towards nature. The sad truth is, today, for every responsible photographer who respects nature and tries to minimize his or her impact, there are hordes of unruly, uncaring shutterbugs who’ve become a menace to wildlife. Many photographers probably don’t even think about their impact on wildlife, and may regard animals simply as ‘models’ that exist for their photographic pleasure. It probably does not even occur to them that their actions could cause stress to an animal, perhaps even affecting it profoundly. Simply becoming aware of the issue might make many photographers – at least those who are otherwise ‘decent’ folks – think carefully on their next outing, and modify their behaviour appropriately. Take the example of one of the world’s rarest birds – the critically endangered Great Indian Bustard. This large bird, which lives in open grasslands, is extremely wary of intruders. When it spots someone even hundreds of metres away, its reaction is to stop whatever it is doing and fix its attention on the trespasser. As long as the ‘threat’ persists, the bird will not feed, court or mate, impacting its very survival. 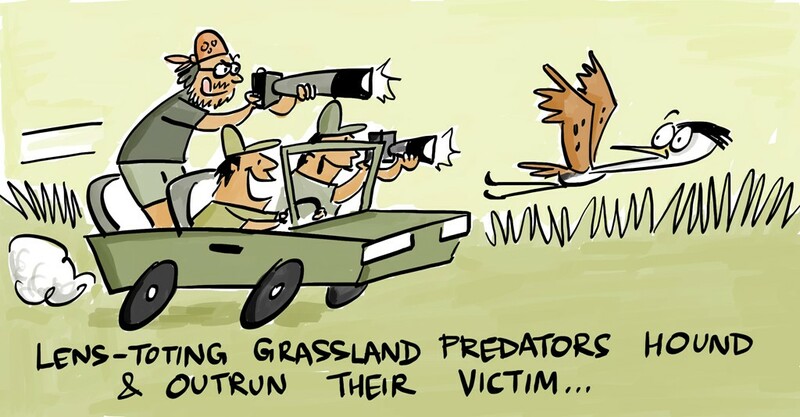 As a result of the disturbance caused by some insensitive photographers, the Ministry of Environment and Forests (MoEF) was constrained to issue a circular curtailing photography of the bustard during its breeding season. Unless we proactively check the menace of unethical photography, we can expect more such directives in the future, which will affect the photography community as a whole. Damage to habitats can be immense too, when many photographers and their vehicles converge on a particular location. For instance, the Hesaraghatta grasslands on Bangalore’s outskirts suffered tremendous damage and destruction as a result of overenthusiastic weekend bird photographers. Fortunately, thanks to the issue being highlighted and talked about, there has been a change for the better in some areas. While it’s impossible to catalogue or list every type of ‘unethical’ behavior, one’s conscience and common sense are the best guides. If you believe that something you are doing, or are about to do, may cause distress to your subject, or damage its habitat, back away. It’s as simple as that. 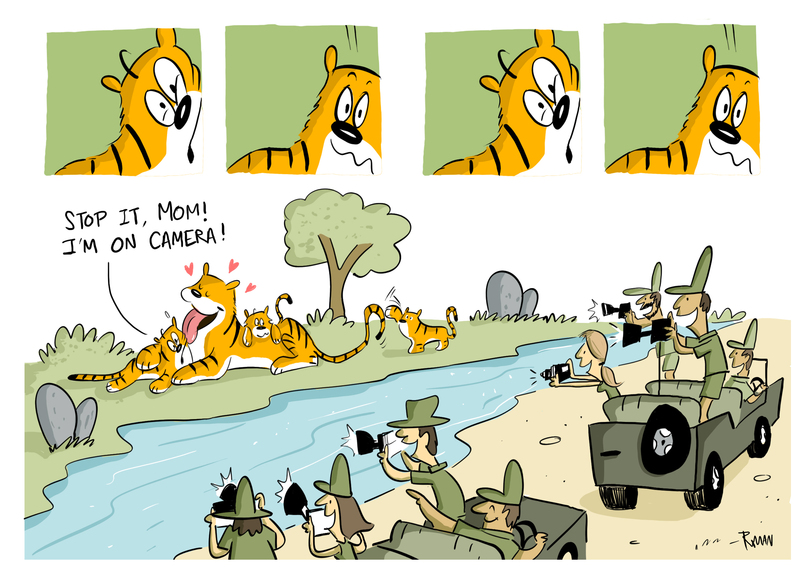 Like it or not, the thirst for wildlife photography seems to be growing unabated in India. So it’s all the more imperative that we work together to minimise any negative impacts. But given the fact that there isn’t an ‘All-India Association of Nature Photographers’ to set standards and monitor behaviour, how do we go about regulating the practice of nature photography by thousands of enthusiasts around the country? There probably isn’t any one way of doing it, but that doesn’t mean we should throw up our hands in despair and absolve ourselves of any responsibility. The single, most important factor in changing behaviour might be to set a good example. Good role models are important in any field, and wildlife photography is no exception. If you are a veteran photographer, strive to be a good role model, and lead by example. If newbies see you adopting questionable practices in the field, they will assume that this is how wildlife photography is to be done, and emulate you. In effect, you would have amplified your bad behaviour by inadvertently passing it on to others, and created a nasty ripple effect. On the other hand, if you are seen being respectful of wildlife, not only will your stature go up, but your attitude may also rub off on many others. As a veteran, you probably also have a lot of followers on social media. 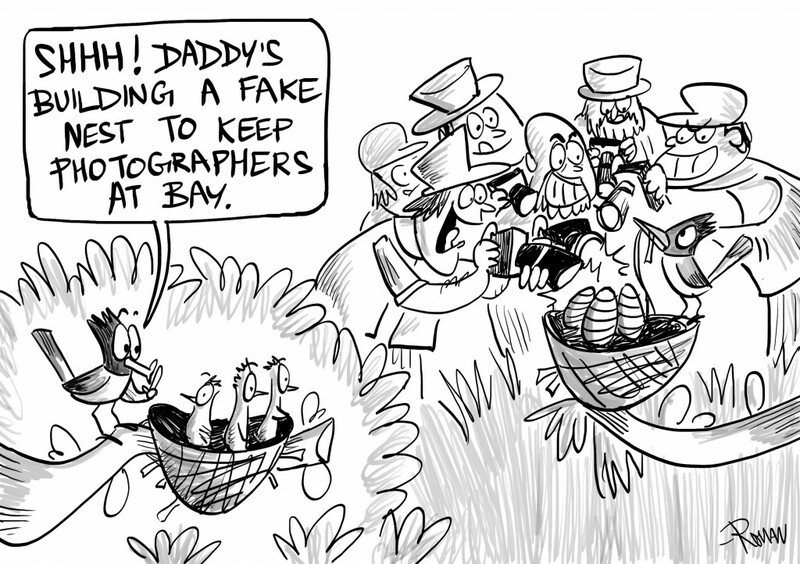 Reach out to them frequently with messages about ethical photography. It costs you nothing, and will make a strong impression on those who are still finding their feet with this hobby. If you conduct wildlife photography workshops, start and end each one with a strong plea for ethical behavior when photographing nature. Make your participants take a sincere pledge towards ethical photography. This will definitely have an impact on those who are lacking in awareness. As for those who simply don’t care, they will be forced to change their behavior when more and more photographers become respectful towards nature and intolerant of unethical practices. For this positive multiplier effect to work, the most important thing is not to be cynical about our ability to bring about positive behavioural change. Here’s an example of something that all of us have seen: when a street is kept clean due to the efforts of some of its residents, others hesitate to throw their litter on to it. When they do, there are usually enough vigilant eyes to reprimand or shame them, ensuring that they don’t do it again, gradually bringing everyone into line. In the same way, we can clean up unethical wildlife photography, if we collectively practice and preach what’s right. While it’s not always possible to define ‘unethical’ in black and white terms, or point out every example, here’s an indicative list. Please note that several of these practices, in addition to being unethical, are downright illegal and violate several wildlife and environmental laws. If reported, they could attract stiff penalties and prosecution. Too many people or jeeps crowding around an animal in a sanctuary or National Park, or deliberately going too close to provoke a snarl or a charge. Causes tremendous stress, and disrupts the animal’s natural behaviour, such as hunting, feeding and courtship. In the case of large animals like elephants and tigers, regularly being subjected to crowding might make them more dangerous. When you spot an animal, maintain a ‘safe’ distance between the animal and the vehicle. When you see other vehicles approaching, take a few pictures and leave. If you see any of the drivers, guides or photographers misbehaving, discreetly shoot a video of this and report it to someone in authority. You can also upload the video to YouTube and send us the link. Blue-tailed Bee-eaters in Naguvanahalli near Mysore being mobbed by photographers. Harassment of hyenas in Velavadar, Gujarat. 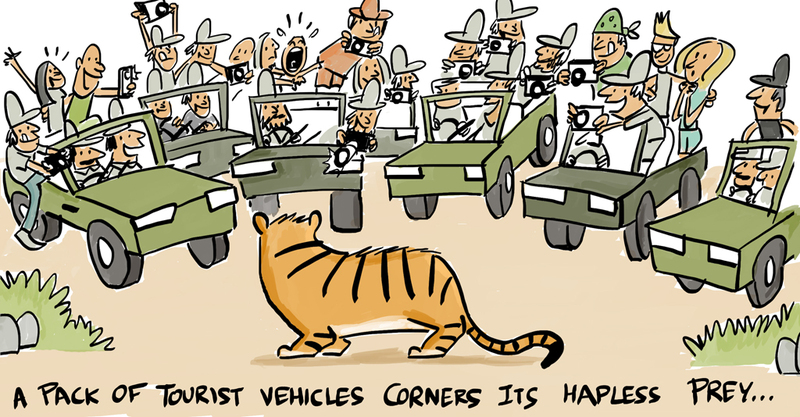 Crowding of tigers in Kanha, Bandhavgarh, Ranthambore and other tiger reserves. Chasing European Rollers in Hesaraghatta. Hassling leopards in Kabini, Nagarahole. Photographing birds at their nests or near it, or mammals at their dens. Causes stress and disturbance and could lead to abandonment of the nest or den. In the case of mammals, it often forces the parents to move their litter to another den, which may not be as safe as the original one. This type of photography can also attract other photographers or even poachers. Avoid nest or den photography. Stay away from newborn or young animals. Needless to say, this also includes manipulating nests. Publishers (including moderators on online forums) should be very strict about allowing nesting and denning images. Photographers crowding and disturbing nesting Oriental Dwarf Kingfishers in Maharashtra. Waiting near dens of Desert cats, Desert foxes, Hyenas, Wolves, etc. Studies have shown that this can cause stress to birds. 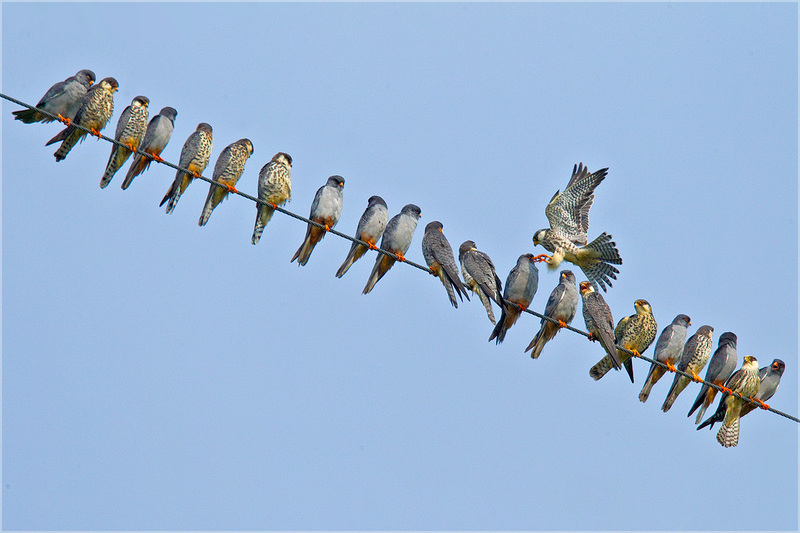 The available literature suggests that responding to call-playback may result in serious energy costs for the bird, disrupt social systems and even lead to pair break-ups. 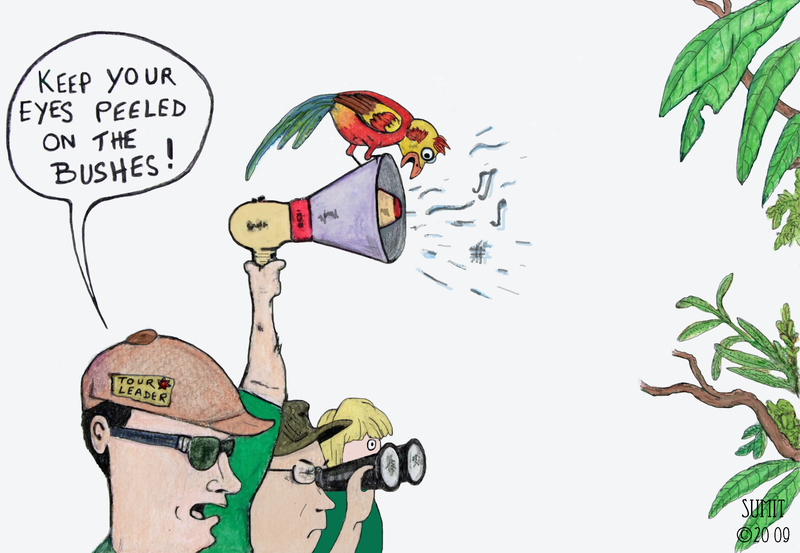 Call-playback during the breeding season could distract adults from more important tasks like courtship, nest guarding, and defending territories, all of which could have dire consequences for breeding success. Desist from this practice, especially for rare and endangered birds. 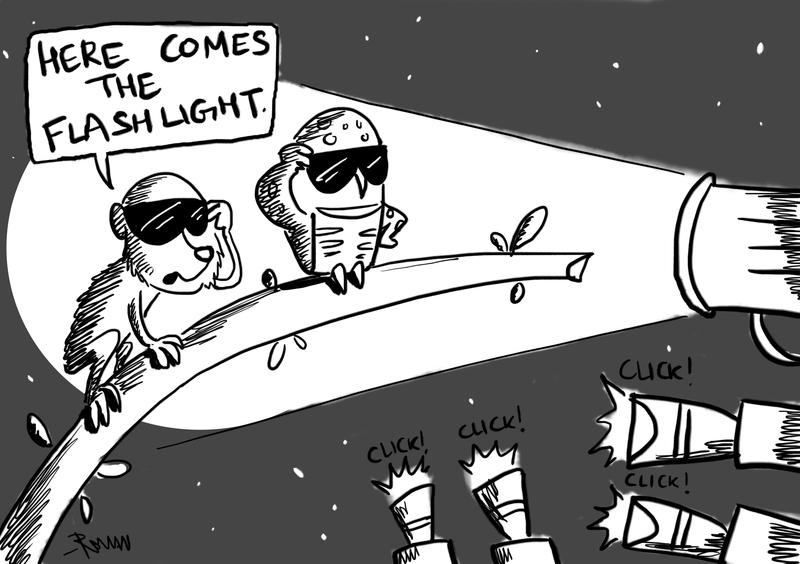 Nocturnal animals, especially creatures such as nightjar, lorises and owls, have extremely sensitive eyes, and can get temporarily blinded by powerful torches and flashes. Biologists who study such creatures therefore use diffusers and red filters on torches to minimise the impact of lights on the extremely sensitive retinas of these animals. 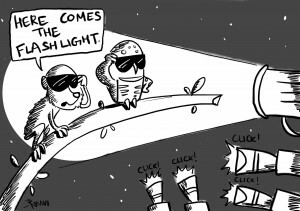 Leave nocturnal animals alone. If there is a good reason (such as research) to photograph them, it might be better to use a night vision video camera (which relies on infrared) and take some frame grabs from the recorded video. Tremendous stress; no energy left for other activities, or even to escape from predators. Obviously one cannot plead ignorance here. This is one of the most despicable things one can do, and a person who practices this cannot be regarded as a nature photographer. Such a person should be named and shamed and not allowed to get away with it. Chasing wild assess in the Rann of Kutch. To begin with, catching and handling wild animals is illegal. It also causes them severe stress. If a snake has just eaten, its first response to handling will be to regurgitate its food. Amphibians may get infected with fungi and bacteria from your hands, which can be deadly to the individual and sometimes to the entire species in the area or landscape. Keeping them out of their natural environment will cause their skins to dry up, and may impact their survival. Some photographers have even been known to refrigerate quick-moving amphibians and reptiles in order to slow them down for photography. This is extremely detrimental to their physiology and may even cause death, albeit out of sight, after you have moved on. 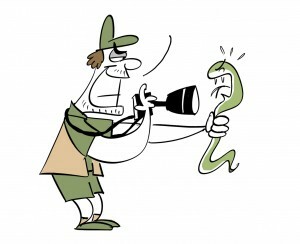 Photograph amphibians and snakes in their natural habitats without handling or disturbing them. Never resort to refrigeration. Work with an ethical herpetologist to ensure that no harm comes to the animals. 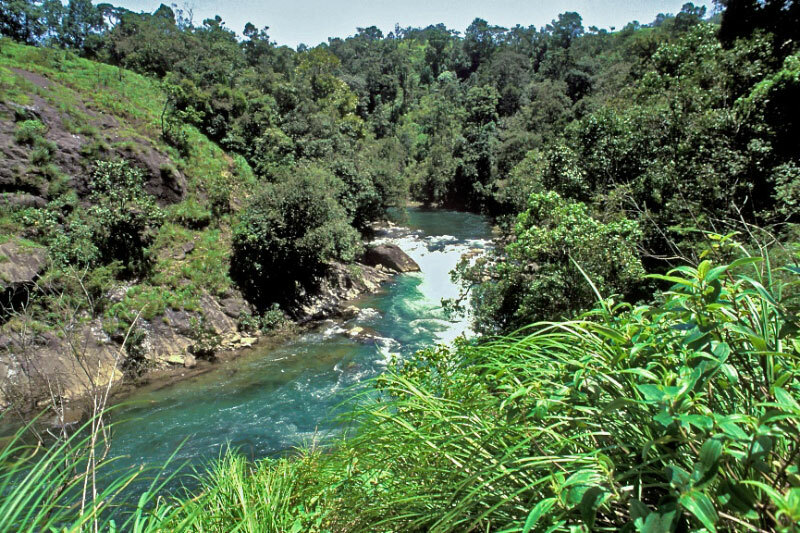 While almost all parks, especially tiger reserves, have banned the use of wireless radios and cellphones, violation of this rule is quite common. 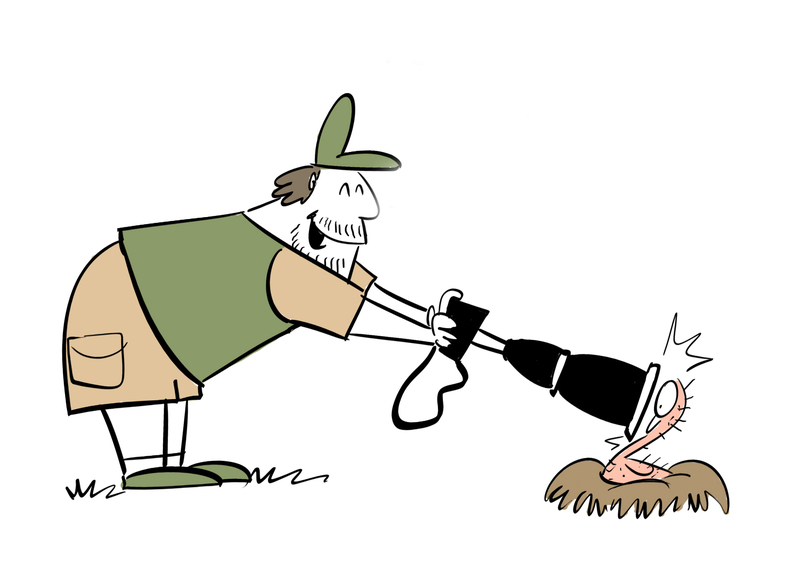 These practices encourage crowding, and totally kill the pleasure of ‘chance’ encounters in the wild. Also, the sounds of phones ringing and people talking disturb wildlife, as well as those who have come to enjoy nature. Using a cellphone in the wild in non-emergency situations demonstrates utter disregard for nature. Do not instigate the driver, naturalist or guide to seek information about the presence of animals. Enjoy the forest and whatever comes your way. Don’t miss out on all the other wonderful creatures of the forest in the single-minded pursuit of ‘big game’. Alters the behaviour of wildlife and could have long-term repercussions such as increased habituation and, in the case of carnivores, result in attacks on livestock or even humans. Do not bait animals for photographs. Please note that this is a strictly illegal activity as per the Wildlife (Protection) Act 1972, and could invite the same penalties as hunting. Baiting snow leopards in Ladakh. Baiting leopards in Bera, Rajasthan. Using snakes as bait for raptors in Hesaraghatta. Off-roading in sensitive habitats like grasslands, salt flats etc. can be disastrous for ground-nesting birds and scores of plants, insects and snakes. It can also cause immense damage to the habitat itself. Applicable while being on foot also. Avoid off-roading. While on foot, stay on designated paths / trails. Driving fast to get to a “sighting” or in order to exit the park before the gate closes, not only frightens wildlife but could also result in animals getting run over. Although speeding is strictly prohibited in wildlife reserves, it is unfortunately quite common. Always stick to speed limits. If there is no speed limit prescribed, try to maintain low speeds (20 kmph) to ensure that there is enough time to stop if an animal suddenly crosses the road. Lodge complaints against drivers who indulge in speeding. We believe that there is a significant responsibility from publishers and editors of wildlife and photography magazines, as well as online communities and Facebook groups, to ensure that their contributors meet ethical standards. Images that are questionable should not be accepted. In the past, such leadership by magazines has resulted in curbing undesirable practices such as nest photography. 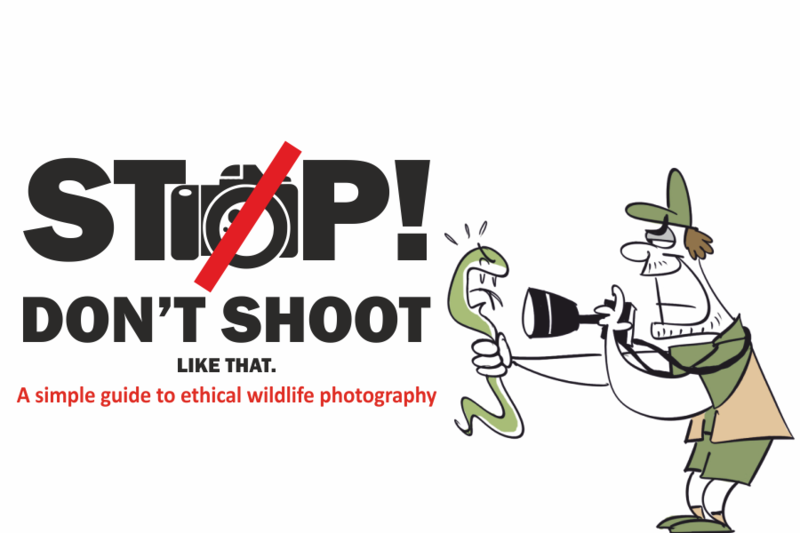 We believe that following these guidelines and sharing them with fellow photographers will promote the well being of wildlife and natural habitats. In the field a photographer must exercise good judgment and, when in doubt, wildlife should always get the benefit of doubt. Conservation India is grateful to the following for their valuable inputs (in no particular order): Aditya Singh, Sudhir Shivaram, Jayanth Sharma, Sugandhi Gadadhar, Jayanand Govindaraj, Sandesh Kadur, Sarath Champati, Sumit Sen, Adesh Shivkar, Bikram Grewal, Bittu Sehgal, Rajneesh Suvarna, Sachin Rai, Shreeram M V, Rohit Varma, Rana Belur, Kalyan Varma, Vijay Mohan Raj, Karthikeyan S and Vikram Hiresavi. Thanks to Sugandhi Gadadhar and Veeville Designs for editing, formatting and laying out the article. Thanks to Rohan Chakravarty and Sumit Sen for their cartoons. This document is a start and will remain a work in progress. If there is anything else you would like to see added, please let us know and we’ll do our best to include it. Write to us at info@conservationindia.org. Shekar Dattatri gave up a career making wildlife films for international channels to produce conservation films that could make a difference in India. Ramki Sreenivasan, an ardent bird photographer, co-founded and runs Conservation India along with Shekar.